One of the great things about the E-learning Heroes community is all the awesome ideas and contributions that are generated there every day. If you aren't dropping by on a regular basis, you’re missing some really great stuff like this awesome slider interaction by Richard Calcutt. When someone else recently wanted to use a slider interaction to track their user’s responses, we were able to simply expand upon the great head start that Richard gave us and quickly come up with a solution. Watch this screencast to see how you can use a slider interaction for user input and also track their responses in your LMS. If you’re interested in learning how to create slider interface element you can find the steps along with a sample file that Richard Calcutt has shared here. There are a couple of ways you can translate the user responses from the slider to one of Articulate Storyline's built in question or survey types. In this case, I chose to use a freeform Pick One question type. 1. 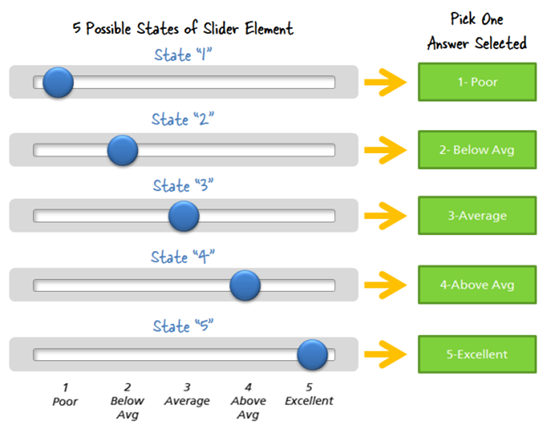 Add 5 shapes as the possible answers to the Pick One question that match the possible selections available on the slider. Move them so they are off the slide. 3. 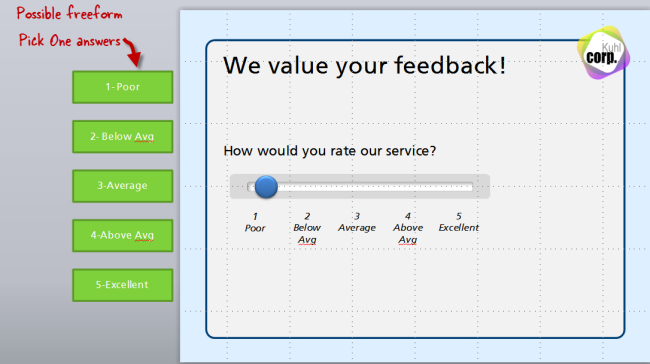 Turn off the option to provide feedback. Since the slider works by simply displaying one of the five states corresponding to the selection that is made. If the state of the slider is “1” we want the first freeform answer to be selected. If the state of the slider is “2”, the second freeform answer should be selected and so on. We can use some simple triggers to automatically select the appropriate corresponding Pick One answer. For example, this is the trigger for selecting the Pick One Answer "1-Poor" when the state of the slider object is set to "1". Each of the five possible Pick One answers will have a similar trigger. Now just include this slide in your Results slide and the user selections made with the slider interaction will be recorded in your LMS. How could you use a slider interaction? Jump on over to the community to share your ideas, or just take a look around and see what other great things are percolating over there today. That's weird...It's working for me. Maybe try to copy & paste the URL? https://community.articulate.com/discuss Any better luck now? I get an error also. Tried copy and paste--still get the error. Sorry..Not sure what's up with the link. Here is the gist of it from Richard's post: Here's what it does: http://s3.amazonaws.com/tempshare-stage.storyline.articulate.com/stp180no63a116tp17jcs6f1ej4doe4/story.html So it works like this: 1) Each stop on the slider is now a whole new image, i.e. the bar and the circle. 2) Each image is a different state. 3) There's an invisible large box over each stop on the slider, and a smaller box on top of those that the user can drag. 4) As the small box is dragged over any of the larger boxes, it changes the state of the slider image to show the associated position. The storyline file is here: http://community.articulate.com/cfs-file.ashx/__key/CommunityServer.Components.Avatars/Simplified-Slider.story , so it's probably easier just to check that! To link feedback to slider positions: 1) Create the feedback you want to give (an image, text, etc) 2) Trigger it to appear 'when state of SLIDER PICTURE is STATE X' 3) Done! To add more stops to the slider: 1) Create a new set of slider graphics, one for as many stops as you want with each graphic showing a the slider in a different position on the bar. 2) Add the first slider position graphic to the slide, and add each of the others as different states. 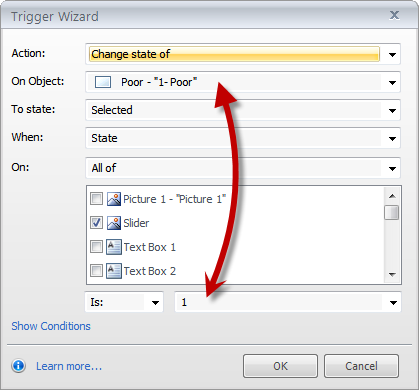 3) Place invisible large boxes over each slider position (do not overlap them) 4) Place a smaller invisible box over the first slider position (over the top of the first of the previous invisible boxes) 5) Make a trigger that changes the state of the slider and bar image to position 1 when the smaller invisible box is dragged over the first large invisible box. Repeat for as many slide stops as you need. 6) Copy the small invisible box with all the triggers attached over each of the other stops on the slide. what a marvelously simple way to make such an awesome graphic! thanks for sharing, this will make some dry material much more interesting! Nice work, Mike. Thanks a lot for making this available. Hi Mike, I know this is an old thread, but I just came across this and it's exactly what we've been looking for. The only thing we would want to do differently is have a results slide that will actually display what the user selects, i.e. show on the slide "you selected 'Below Average' as your answer." Is there a way to actually show learner's what they selected?